The humble butterfrog has largely escaped notice until recently. Ample food, mild weather, and a decline in predators led to prolific breeding, producing a riot of butterfrog species that have spread far beyond their parents' hiding spots in swamps and along forested lakeshores. In this field guide you'll find the basic intro to the ecology of the butterfrog, equipment and magical items derived from such fantastic creatures, a couple of butterfrog variants and the guidelines and inspiration to create your own butterfrogs. Except for being lavishly illustrated, tastefully arranged and meticulously edited -- something which can hardly be taken for granted these days -- the field guide to the butterfrog is also truly original. I must confess that despite my great admiration of Hugo Solis as a gamer and an artist, I was at first somewhat skeptical about the premise of this field guide. A few pages from this lovely booklet erased all skepticism, however, and replaced it with wonder. The notion of a frog that can crossbreed with practically anything, creating an infinite variety of frog-like beings, is quite refreshing. Unlike the gibbous abominations inspired by Lovecraft and company, these creatures are as adorable as they are fierce. Adults will find them a delightful distraction from the usual assortment of D&D beasties, while kids (of all ages) would enjoy an entire campaign based one the manifold variations of the butterfrog. In short, definitely worth a download. This pdf is 20 pages long, 1 page front cover, 1 page editorial/ToC, 1 page advertisement, 1 page SRD and 1 page back cover, leaving a total of 15 pages of content, so let's check this out! While this is the freshman offering from Butterfrog Studios, we all know the mastermind behind this publisher - Hugo Solis, artist extraordinaire is the man behind the Butterfrog and thus, we can expect quite something from this pdf - written by Mike "RPG Superstar" Welham, my expectations for this free freshman offering are quite high. The introduction is already promising -written by an awakened dire badger sage, we are gently immersed in the fluff and led towards the first chapter, in which the ecology of this strange animal is covered and several different origin myths, from fey to fairytale-like beginnings - which is a good cue: We also are introduced to an Aesop-style parable illustrating the strange relationship between butterfrogs and foxes. The physiology of the butterfrog is explained in lavish detail, including believable means of propulsion and flight. It should be noted that a butterfrog's mating season has significant (and somewhat humorous) impact on the creature's behavior, resting in a rather funny dare that is covered including rules: Standing still while a swarm of butterfrogs try to copulate with legs etc. No problems, though: Butterfrogs are only phenomenally fecund with reptiles and amphibians and produce a variety of crossbreeds. Of course, these critters also have their use in alchemy, with for example hallucinogenic butterfrog dust, an oil that enhances the wearer's AC, tinctures to make swimming and disguising easier and even a type of dust that transfers some of the butterfrog's fabled appeal to fey creatures to the recipient. On the less mundane side, their chemicals can be extracted when in mating frenzy, creating the rare and powerful crystalline butterfrog berries, powerful bufffing items. Bards also have a reason to hunt butterfrogs, for from their vocal glands a potent elixir can be made that enhances [sonic]-based attacks. In chapter 3 we are introduced to the CR 1/3 butterfrogs and their stats and it is also here that we are introduced to the crunchy rules for these gorgeous little critters, which include crunchy modifications for butterfrogs in mating season and the Rhinotoad, a CR 1 Butterfrog/Rhinoceros Beetle crossbreed. From croaks to poison to the ability to curl up. Both variants come with drop-dead gorgeous, awesome artworks and a paragraph also hints at truly weird crossbreeds with e.g. basilisks or fey. 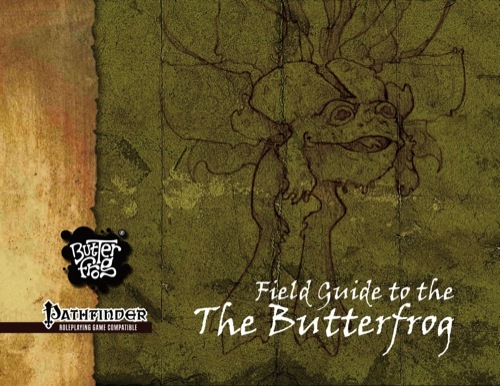 The final 2 pages of the pdf cover a section on butterfrog creation guidelines, providing guidelines that even novice DMs could easily follow without any deeper understanding of the rules to advance the critters. Better, 5 attack forms/abilities are covered - but why you ask? You can create your own butterfrog and participate in a cool contest that might have your submission included in the upcoming Campaign Spots-sourcebook. Editing and formatting are top notch in teh revised version, I didn't notice any kind of glitch. Layout adheres to a 2-column, landscape format style and while it is a beautiful full-color pdf, its layout has elegantly been chosen so to not drain the hell out of your printer - nice! The pdf comes with bookmarks, which is another plus. This field guide ranks among the best free pdfs I've encountered. The artworks by Hugo Solis are simply stellar and really make you want to use the little creatures. And Mike Welham's writing further improves them: Essentially, from the dare, to origin myths to the alchemical and magic items, each has a hook, seed or idea that might lend itself to adventure creation. Better yet, the creatures feel like they do organically belong into the world and while they are playful beings, they can also lead careless beings to trouble. Add to that the crossbreed-possibilities and we're in for a pdf that is fun galore - also because it has this peculiar quality of innocence. These beings could show up in a children's movie, as they breathe this sense of wonder and almost allegorical lessons about size and power, beauty and perspective and just feel...innocent to me. Original and innocent. That is until mating season starts and the comedic potential of the little beings is amplified beyond belief. I honestly have nothing to complain about this pdf and especially for a studio's freshman offering, I'm quite impressed and look forward to seeing more! And this is free! Free is always hard to beat indeed and thus my final verdict will be 5 stars + endzeitgeist seal of approval. With the Field Guide to the Butterfrog Hugo Solis introduces us to his latest venture, the publishing company ButterFrog Studios. Right off the bat, you know the visuals are going to be phenomenal, I mean seriously, Hugo Solis...if you aren't familiar, first off, where have you been for these last few years, second, deviantart, Butterfrog, now...I'll wait, take your time, soak it in...better? all caught up? Good, let's proceed. Now, for the freshman offering from this new imprint Mr. Solis presents us with a manual for the creatures sharing his namesake, and finally puts to rest the origin of said name. I have to admit, the cook in me had gone another route on the origin of the name, lol. Follows a dual column format with embedded imagery. Weighing in at 20 pages, with 5 of those pages going to covers, OGL and credits/TOC...as well as a one page ad for a contest to get your very own butterfrog included in the next offering from this imprint...very cool. That leaves us with 15 pages dedicated to this bizarre little creature, so lets dive in. Chapter One gives us multiple theories on the origin of the first butterfrog, including a legend reminding mortals to never betray the love of fairies, great story! Here though, I find the second editing/grammar mishap, with the usage of chose instead of choose. Here also we find an excellent parable regarding the relationship between foxes and butterfrogs...written along the lines of the frog and the scorpion parable, it carries with it an authentic feel that helps sell it very well. The physiology of these creatures is handled very well, with the guide presenting them in a believable manner. The hiding of their wings across their carapace, the armor scaling...the fact that they are described in flight as looking like , and I quote..”a fat tailless dragonfly.” lmao...gold, absolute gold. The butterfrog is detailed in both its alchemical/druidic value for components and such, as well as it's various effects upon its surroundings, both natural and communal. Small human communities that learn to keep their distance from local butterfrogs find that they are beneficial to have around, for a variety of reasons. And yes, even the playful fey touched froggies have a darkness, that should never be seen unless wrong is done to them. Imprisoned butterfrogs lose their coloration and joy, looking more like a moth than a butterfly, until either set free or escaping...at which point they become either a dreadfrog or gloomtoad, exacting their revenge upon those who imprisoned them. Five new pieces of equipment/magical items make up the bulk of chapter 2. Items like Butterfrog Dust – crafted of the poison secreted by the butterfrog, a hallucinogenic. Carapace Oil – gives an alchemical bonus to armor with a movement penalty, Feyfriend – is a powder crafted from butterfly wings that when applied to the skin makes one appear more appealing to fey. Metamorphic Gel – crafted from the slime coating of the butterfrog gives bonuses to Disguise and Stealth checks. Swimmer's Oil – gives a bonus to Swim checks, and is derived from the oils of a butterfrog's dermal glands...This would be the type of detailed breakdown that helps sell a guide on a creature...for alchemist players knowing what they can craft from any part of a creature is invaluable. Now, magic items...we have Butterfrog Berries – crafted from chemicals taken from a butterfrog caught in the grip of their mating frenzy (yeah, I'll let you all draw your own conclusion as to what chemicals these are, lol) the berries offer an armor bonus as well as two bonus feats for 1 hour. The Elixer of Resonance is a drink that enhances one's voice by extending the range and effect for auditory effects, as well as giving a bonus to underwater verbal spellcasting components. Out of all of the equipment and magic items, this would be the only one failing to tell us what part of the butterfrog is required to make the concoction though, kind of a shame of a shame as it breaks the feel, and ends up feeling clunky in comparison to the others. A rather interesting list of known crossbreeds and variants is given after the standard butterfrog's stat block. I am hoping Mr. Holis and crew are planing on detailing each of these with art in future volumes. And for those wondering, yes, there are magical crossbreeds...frogatrice anyone? For now we are given the Rhinotoad (cross of the butterfrog and rhinoceros beetle) with a full statblock and artwork...and yes, he looks awesome. The CR is missing from the statblock for the rhinotoad, but the XP is given, so it can be deduced. Chapter 4 covers that section I can see a lot of folks playing with, the recipe for creating your very own variant butterfrogs. Starting with a base, and presenting the different components with formulas depending upon what you are combining with the butterfrog, this chapter will walk you through the process of creating your very own little fey induced weirdness. Which is a good thing, since Butterfrog Studios is counting on you wanting to create your own variety to enter their contest. The final page covers the basics of said contest, and points you towards the website for more details. I know I'm planning on entering, these things are just to much fun not to. Final thoughts: OK, layout - fantastic. Editing – two grammar mishaps, one statblock mistake. Am I being to harsh? No. Is it a free product? Yes. So does it matter if there are mistakes? Yes. Only way to get better is to know what you've done wrong. On the bright side, there was very little, and I mean very little wrong...I was seriously impressed. First time out the gate and that was all I saw, that's pretty good. Tallying it all up, the things I love about this PDF far outweigh the few mistakes that did not, in the end, detract from the understanding of the material. Giving this a 5 star rating, and can't wait to see what's coming next. I hope you enjoy it and help us hunt down more and more butterfrogs! This won't be as good or thorough a review as those done by some of the regulars so I'm not going to officially add it as a review. Just my immediate observations. Appearance: Excellent. Page layout and design is very appealing. Art is high quality. Mechanics: Look to be in order but didn't do an in-depth examination. Concept: Very appealing. I'd almost certainly use something from this book. Page 16: Odd wording/Typo: "There is no purchase is necessary to enter the contest..."
OGL: Can't find a Product Identity/Open Game Content declaration so I have no idea if any of this can be added to d20pfsrd.com. Don't miss the chance to get published in BFS's product No.1 alongside Michale Welham and score hefty froggy prizes!!! Thanks for the heads-up, We'll look into it right away. Didn't think about making this Open COntent, but I think we will. Let me find out how this is done and we'll add it right away. Beautiful work, Hugo, Mike and Sarah. Hugo, this was an excellent freshman project for your new Imprint, very impressive. Fell in love with the little critters instantly, and am hoping you do make them Open, as I would love to include them in something down the road. Review is up. Wow! Thanks for the glowing review, KTFish! I'm so glad you enjoyed the book. Excellent.. hard not to give a good review. If this is a fair example of what to expect from future offerings from this imprint, then I would suggest to people they add Butterfrog Studios to their watch list as there should be some very interesting product coming. The PDF is already corrected and will be updated soon. Oh, and the "Create your Own Butterfrog" contest starts today! Study well your field guide and use Nigel's experience on your behalf. Track down, study and research your butterfrog and share your findings with the world! The first 5 entries will get a full color printed signed copy of the Field Guide to The Butterfrog! And reviewed here and sent to GMS magazine! Cheers! You have only until August 26th to get your entry in to the "Create Your Own Butterfrog" contest, so get hopping! The contest Submission deadline got extended until Sept 3rd. (GenCon can sure mess with deadlines...). Final week to hunt down you butterfrog to get published and win croaking prizes!! Last day to submit your contest entry is Next monday, September 3rd. Thank you very much for the nice review, Uri! Contest winners announced at 12 pm, Seattle time! Congratz to winners Crystal Frasier, Richard Flanagan and Tom LeBlanc for they fabulous butterfrogs! Crystal's butterfrog will be added (and updated) to the field guide in October. very cool and congratulations to the winners. Soooo, I gotta ask: When do we get to see the field guide? I'm looking forward to it! It's been a crazy 7 months and we are still developing this. Dozens of 'frogs have been created and the filed guide will be a hefty open source document that will get published this year past the first half. Hopefully by PaizoCon we'll have a nice and big preview. After a 3 year wait, this froggy baby is back in the production line... Why 3 years? On 2012 right after publishing I got involved in a HUGE RPG project that took all of my time... SOme of you may still remember that infamous KS. On 2013 my wife got pregnant and all priorities turned to make our place liveable (we didn't even had our own bathroom back then, go figure). On 2014 Our baby is born on a very difficult delivery and things turn a bit (a lot!) stressful healthwise for both my wife and baby. Nowadays our boy will go tu surgery this or next month (darn/blessed social security), we take him to physical and other kinds therapy from 2 to 4 days a week and aaand we'll get labs results from genetic (the cherry on top) in a couple weeks as well. So I've been busy with daily life. So the next few weeks are a turning point on our family life and it's time to get back on the RPG saddle. We'll get the winning entries in the book and expand it a few more pages of extra goodies. If there's anything in particular you'd like to see further developed, just say so and we'll see what we can do!